Alfredo sauce—pretty much cream and Parmesan cheese—is a shockingly easy luxurious treat to make. Here, the ante gets upped with the addition of pumpkin (or butternut squash or acorn squash or whatever winter squash you like) purée, along with a smidge of minced garlic and a dash or two of cayenne pepper if you dare. The pumpkin adds more than its orange color, it brings a fair amount of sweetness to the proceedings, as well as a depth of flavor that turns classic alfredo into something equal parts homey and indulgent. Don't even think about using anything other than top-notch pasta in a long and twistable, tangle-able shape. Dried pasta is fine, as long as it was made with eggs and of good quality. 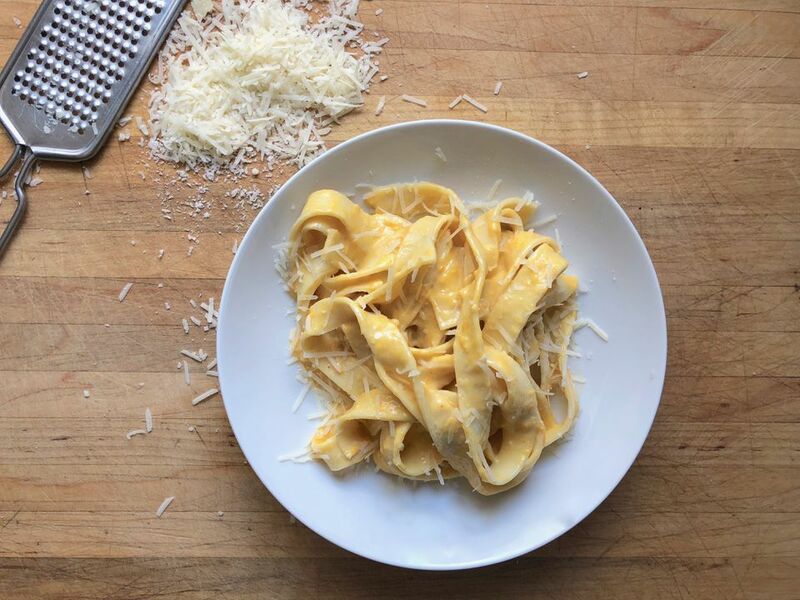 Fettuccine is fine; thicker tagliatelle is even better; wide and flat pappardelle (as pictured) is glorious in its ability to grab the sauce and transport it into your mouth. Meanwhile, over medium heat, melt the butter in a wide sauté pan or another vessel that is large enough to hold the pasta once cooked. Add the garlic and cook, stirring, until the garlic soft and very fragrant, about 2 minutes. Add the pumpkin and cook, stirring frequently, until any excess moisture cooks off, about 3 minutes. Add the heavy whipping cream and stir to combine. Sprinkle in the salt and cayenne, if using. Simmer until the mixture has thickened slightly. Add the cheese and stir to combine and melt the cheese into the sauce. Keep the prepared sauce over very low heat while you cook the pasta. When the water is well and truly boiling, add the pasta and cook until al dente (you'll be combining it with the hot sauce, so it's going to absorb more liquid after it's drained). Just before draining the pasta, dip a measuring cup into the water and draw out about 1 cup to hold in reserve to thin out the sauce, if needed. Toss the cooked and drained pasta in the sauce, and thin as needed using the reserved cooking liquid. Season to taste. Top with additional Parmesan and freshly ground black pepper or other garnishes, if you like. Serve immediately. *Canned is fine, as long as it is unsweetened. Or puree cooked pumpkin or squash—putting it through a food mill to do so, if you have one.